As we close out 2018, many of our non-profit clients have been asking about the future of car donation programs for 2019. So in this special edition of our Wreckonomics™ Series, we’re going to focus exclusively on the future of charity cars programs. Advanced Remarketing Services’ Charity Brand Manager Ali Lyons, wrote about the 2018 Job Act in this earlier post. The tax law changes certainly are having some negative effect on donation giving and have reduced the incentive to give. 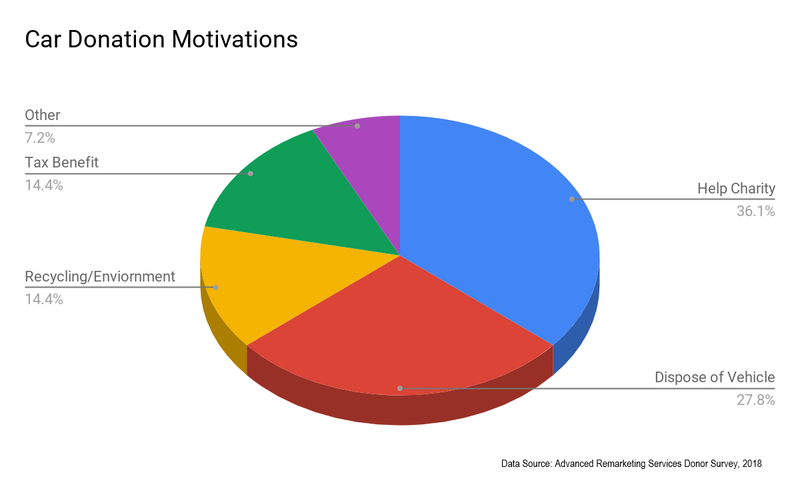 However, we previously did some polling of our vehicle donors on motivation, there are some very interesting results regarding why people donate cars. Supporting charity, getting rid of an old vehicle due to use or repairability, and even recycling an older car. Earlier this year the Non Profit Times predicted that the number of itemizers would drop approximately 56%. However, as seen above this has never been the driving force behind car donation. Prior to the 2018 Tax Law changes, only about one in three U.S. taxpayers were itemizers anyway. The incentive to donate has certainly taken a hit but car donation volume hasn’t shown any signs of weakening. Most of our programs have grown in 2018 and we predict that growth to continue. For the last three years, values of charity cars have performed beyond expectations. Fueled by strong new car sales, a booming used vehicle market and global steel production at record highs, car donation programs have continued to produce surprisingly strong results. However, while the immediate future is bright, we are also dealing with some real concerns for our forecasting models. Changes to credit rates will slow down some of the recent market strength, but can offer some areas of opportunity. Less available credit at the top of the market has been pushing up demand for older and lower value vehicles but will absolutely reduce purchasing dollars in the sector. The potential of legislative & policy mistakes, trade tension and a seeming retreat from globalization is impacting long-term economic outlook. It is the uncertainty of these recent measures that create the most confusion. 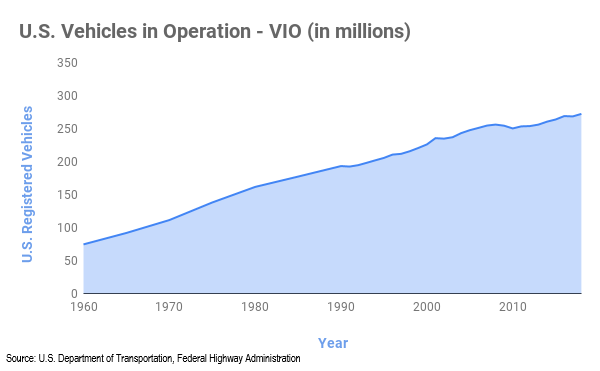 As you can see here vehicles in operation is at an all-time high. In this unprecedented period of economic expansion, lowered unemployment, and easy credit, new car sales have been steaming along and increasing the number of vehicles on US roadways. At the same time vehicles have been lasting longer than ever, increasing the average age of the vehicle fleet to a record 12 years. Car donation programs have become a preferred channel for dealing with your car as it ages out of use or importance. They will continue to be a strong stream of unrestricted revenue for our partners in 2019 and many years to come. If you are a charity and have questions about your car donation program and would like some insight on how to make your program better, reach out to us alyons@arscars.com. Advanced Remarketing Services (ARS) is a technology company focused on the remarketing and automobile recycling sector. ARS’s primary focus is older, high mileage, & end-of-life vehicles (ELV). Wreckonomics™ is an ongoing series to focus on the broad economics related to the end of life vehicle. We examine the sustained and specific appetite for this type of asset both domestically and internationally.